Memorial Day is not about new deck furniture for the shore house. Often it seems anyone with something to sell views Memorial Day as solely a marketing opportunity. It’s also not about “unlocking the beach” or the price of steaks for the barbecue fires. Sadly, it’s also not about the well-intentioned but misplaced thanking of veterans for “their service.” It is about honoring and remembering those who died when this country asked for a life commitment. Our stopping to remember is what gives meaning to those lives that are now going unlived. While the day is meant for those who died while in military service, war is never simply about those in uniform. The casualties at home are equally crushing, sometimes even more disturbing. Nevertheless they are casualties of war. On this day, I remember them, two especially. 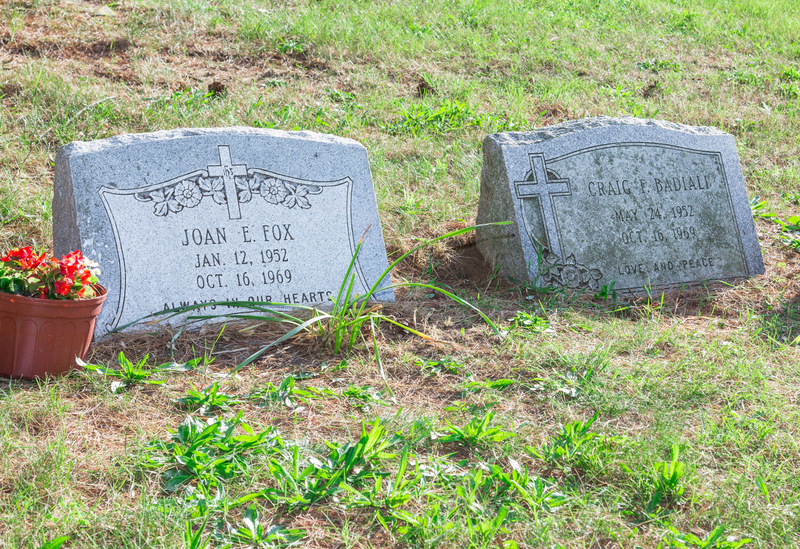 The graves of Joan Fox and Craig Badiali this Memorial Day in Chews Landing, NJ. In 1969, the U.S. was “at war.” We weren’t technically at war; the U.S. Congress didn’t have the courage to actually declare a war. They simply ordered the might of the U.S. military to descend upon a little country in Southeast Asia called Vietnam. The country was “divided” they said and the people with a political agenda unpopular among U.S. politicians were threatening to impose that agenda on a people having a political agenda we had imposed from many thousands of miles away. Thousands upon thousands of U.S. military human beings were being killed in Vietnam and hundreds upon hundreds of thousands of Vietnamese people, military AND civilians were being killed. This murderous activity produced a divide in the U.S. Many people opposed our involvement in Vietnam; many other people favored it. Emotions ran high. On October 15, 1969 a national event called the Moratorium to End the War in Vietnam took place. Millions marched to demand we stop warring in Vietnam. “Teach-In” activities on nearly every college campus sought to educate people about the facts and costs of “war” that had been raging for years. Joan Fox and Craig Badiali, students at Highland Regional High School in Blackwood, NJ attended events that day at Glassboro State College. Unlikely protesters, he was president of the school drama club, she was a varsity cheerleader. That evening the two 17-year-olds sat in Craig’s car and breathed exhaust fumes until they were dead. They believed their deaths would end the war and bring peace. Suicide rarely, if ever, brings anything good. The lives of Joan and Craig were heaped upon the lives of countless other dead from the “Vietnam Conflict.” I don’t believe it helped convince politicians or anyone else to end war. What it did cause was bottomless grief, turmoil and a period of shameful history in their community. Joan and Craig were promising young adults. They would have been 62 years old if they had chosen to live their lives. Who knows what good they could have done if they had made a different choice. No matter the circumstances, they are casualties of war, and their sacrifices are neither less honorable nor less worth remembering than any other persons who gave their lives for their country. For they so loved their country, their community and their families, they were willing to give their lives. 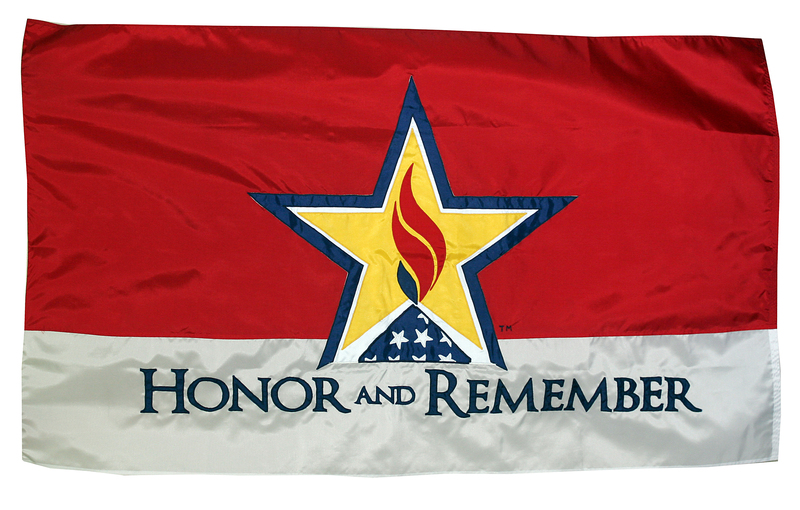 The Honor and Remember flag. Always a fresh perspective. Thanks for the reminder. I was very touched as I am 62 and did attend some of the rallies here at our local college. Yes, there were many casualities of the Vietnam war and some are still alive and still having nightmares and regrets. Did you know these two individuals? No, I did not know them. Thank you for your article honoring these two beautiful people. I lived in Blackwood when Craig & Joan left us. The lives of those who loved (and will always love) them were irrevocably changed. It is incomprehensible to me that we (the US) continue to enter into these wars that cannot be won. We do not seem to be able to learn from past mistakes. At least not yet. I will never forget Joan and Craig. Whenever I go to Chews Landing, I stop and visit their graves. I teach juvenile justice. I always try and incorporate their cause, their lives, and them, in my lectures. I remember that in one of Joan and Craig’s letter they wrote that if even one person was touched by what they did, it was worth it; well, I always try and make sure that my students understand that what happens during adolescence can impact lives. I will always remember Joan as a beautiful, contemplative and passionate individual who cared. I only knew Craig through the play many of us were in, “The Mouse that Roared” and I can only say that adolescence is a time of impression, chemistry and identity. Everyone has a purpose in life and I believe their purpose was to show compassion. Thank you for remembering — and keeping their story alive. You are welcome. They left an impression on me that will live forever. I am not alone – they impacted the lives of many. Now, I follow politics, I give my voice, and I remember the vulnerabilities of youth. I believe I went to school with a relative of yours, Rick, and his wife, Ruth Wonderful people. Later, I worked with a relative of Ruth’s, Andy. I will never forget Joan and Craig, and yes, their lives mattered……a lot. Sad to hear about the anniversary of this senseless tradgedy. I lived right across the street from Joan’s house and I am there now at my parents house! I did not know Joan personally, I was only 11 at the time. My older sisters all went to school with her. She was a bit quiet, though she did have friends. She would sometimes walk up to the elementary school behind her parents house and sit on the grass covered hill there. Sometimes she had a radio, sometimes she shared her thoughts out loud as if practicing some essay or a play script. I do not know why her parents never shared the letters they left behind. I whish they revealed at least some reason for the suicides other than the war. I’d like to think maybe they though they were going to be together in a better place, heaven maybe. I do believe you do not go to heaven if you kill yourself. But maybe they did not know. I hope God showed them mercy and forgivness for these two mislead souls. I am sure they are still missed here by many.